Even (Aún) in the back seat of (de) the car, I use a (uso un) seatbelt. I have (Tengo) the keys of the pickup truck. Javier has to inflate (tiene que inflar) the tires and fill (llenar) the gas tank of the truck. 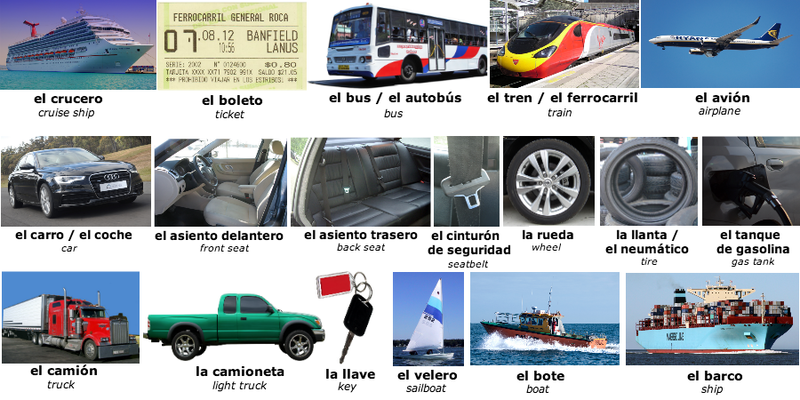 You have to buy (Tienes que comprar) a ticket to get on (para subir a) a bus, train, or plane. A sailboat is smaller than (más pequeño que) a cruise ship. Boats and ships float on (flotan sobre) the water.